We’ve got you covered for everything Christmas. Dinner get ruined? Here are the best chain restaurants open on Christmas, plus a list of Fast Food open if you need a quick bite in between holiday parties. And here are the answers to all those questions about Christmas that you’ve been too afraid to ask all these years. Technically, a Christmas present isn't late until December 26. That means you can technically get away with buying super last-minute gifts as down to the wire as Christmas Eve or even Christmas Day -- if you absolutely must. Will your family be happy when you arrive late for dinner with shopping bags? Probably not, but maybe they'll understand when they open what you purchased in the St. Nick of time. There are plenty of stores open on Christmas Eve and Christmas Day this year, so you do you. While your options may be a bit limited, you know, because stores close for holidays, several major retailers -- from Macy's to Target -- are opening their doors for at least some time on Christmas Eve, Christmas Day, or both. In the spirit of giving, we did all the legwork and made a list of stores that are your best bets for last-minute Christmas gifts. Keep in mind that hours will likely vary from location to location, so it may be a good idea to call before you floor it to, say, Macy's. And keep in mind that while it's not a great time to shop, it's also not a great time to have to work, so be nice to the people who help you. Christmas Eve: Most stores will be open from 7am to 6pm, a spokesperson told Thrillist. Christmas Eve: Stores will have slightly different hours depending on the mall or shopped in which they're located, but you can track down your local store's hours on Nordstrom's online store directory. Christmas Eve: Stores will be open during special holiday hours, 9am to 6pm (local time). Christmas Eve: Most stores are open 8am to 6pm, but check the company's website for your local store hours because they tend to vary. Christmas Eve: Open until 6pm (local time), but hours may vary from store to store. Note: There's a good chance that several additional department stores are also open on Christmas Eve and Christmas Day. We only included stores that could confirm their store hour information directly, when asked via email. If you're looking for another store, your best bet is to try calling or visiting that particular store's website. Christmas Eve: Stores are open from 7am to 6pm, a Best Buy spokesperson confirmed. Christmas Eve: All Walmart stores will close at 6pm local time, according to a company spokesperson. Christmas Eve: Store open at 7am and close at 10pm, but definitely check your local store hours on Target's website. Christmas Eve: Most stores will open 8am and close at 6pm, but some will close at 5pm. Note: There's a good chance that several additional big box retailers are also open on Christmas Eve and Christmas Day. We only included stores that could confirm their store hour information directly, when asked via email. If you're looking for another store, your best bet is to try calling or visiting that particular store's website. Christmas Eve: Many stores will be open for special holiday hours. Check Gap's store locator for store-specific details. Christmas Eve: Check Old Navy's store locator for official holiday hours at your local store. Christmas Day: Most stores are closed, but double-check the aforementioned store locator just in case. Christmas Eve: Many stores are open with special holiday hours, which you can find via Banana Republic's store locator. Christmas Eve: Use H&M's store locator tool to find each store's exact holiday hours. Christmas Day: Most stores appear to be closed, but use the aforementioned store locator to find out for sure. Christmas Eve: A spokesperson for the company said Victoria's Secret stores typically have the same hours as the shopping malls where they're located, so that's what you should check before heading out for a last-minute gift. Christmas Eve: Like Victoria's Secret, PINK stores are open the same hours as the malls where they're located. Note: There's a good chance that several additional clothing stores are also open on Christmas Eve and Christmas Day. We only included stores that could confirm their store hour information directly, when asked via email or on their official websites. If you're looking for another store, your best bet is to try calling or visiting that particular store's website. Christmas Eve: Store hours will vary by location due to shopping center store hours, but all Pottery Barn locations will be open from 8am to 6pm at a minimum, according to a spokesperson. 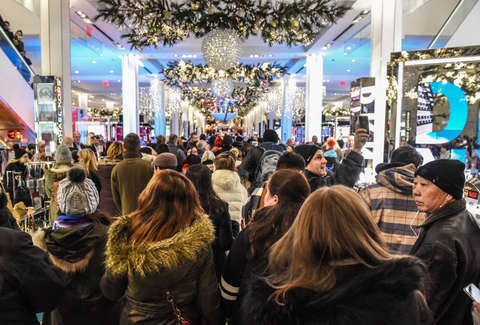 Christmas Eve: Store hours correspond with the mall's general holiday hours, according to a spokesperson, so check your local mall's hours online or by phone. Christmas Day: If your local mall's open, chances are the Bath & Body Works inside will be too. Note: There's a good chance that several additional stores are also open on Christmas Eve and Christmas Day. We only included stores that could confirm their store hour information directly, when asked via email. If you're looking for another store, your best bet is to try calling or visiting that particular store's website.